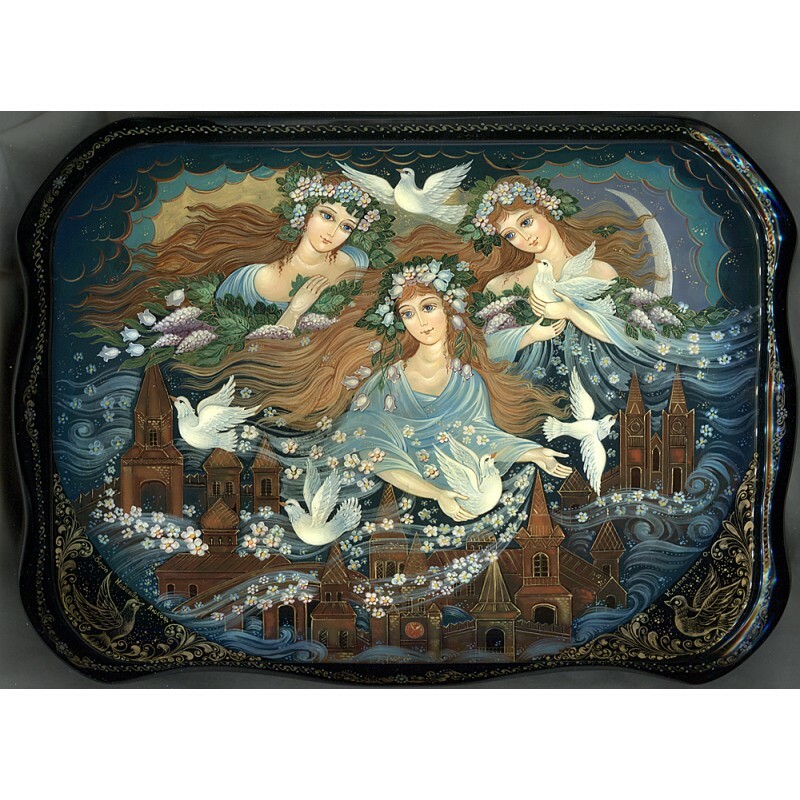 This interesting composition was painted by a talented Kholui artist, Olga Kosterina. The box shows Faith, Hope and Love/Charity, which are the three theological virtues, as well as a group of martyred Christian Saints. Over 2000 years ago widow Sophie went to Rome and stayed in a house of rich woman Fessamniya. Sophie(in Greek-wisdom) has three daughters:Faith, Hope and Love and she cultivate Christianity.When Emperor Andrian has known about that, he asked them to move from their belief. After series of tortures, which they withstand magically with no injuries, he ordered to kill them. They were decapitated, their mom Sophie has buried them and died in 3 days. Girls were only 12, 10 and 9 years old. The composition is painted in traditional Kholui style, framed with a gold ornament, sides are richly decorated with beautiful birds and flowers painted in gold with a dash of blue color. The box is constructed from paper-mache. Black lacquer is used to paint the exterior of the piece while red lacquer completes the interior of the work. The lid is hinged from the top of the composition and the box rests on four legs. 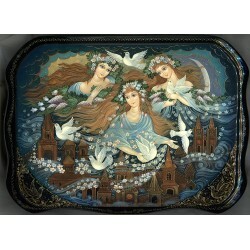 The work is signed by the artist's name, Kholui and title- Vera, Nadezhda and Lubov.